For who knows what reason, millions of Americans flocked this weekend to a science-fiction movie about people trying to peacefully communicate with those different from them. 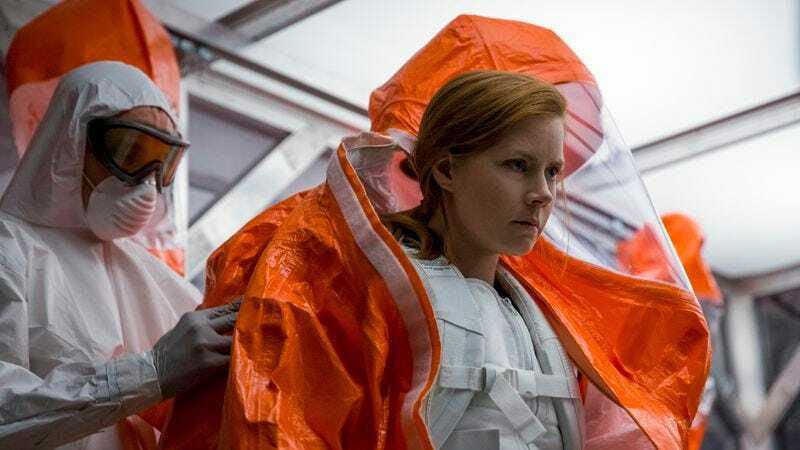 Arrival, whose idealism looks a hell of a lot more quaint than it would have a week ago, opened better than expected, landing in a very respectable third place with $24 million. It’s almost as if moviegoers were unusually attracted, on this particular November weekend, to a would-be blockbuster about an intelligent professional woman ushering humanity into a better future. Or maybe the sight of mysterious spaceships dropping down around the planet is just less scary than, you know, real life. Bring on the aliens, whatever their intentions. This is the fourth autumn in a row that a movie about space (or space ships at least) has scored big at the box office. If Arrival’s debut couldn’t quite match Gravity’s, Interstellar’s, or The Martian’s, Paramount can take solace in the fact that its brain-bending Amy Adams vehicle was the cheapest of the whole lot by a substantial margin. The film has already made half its production budget back, and good reviews—coupled with a desire to escape the crushing reality of the here and now—should keep the film alive into the holiday season. Will next autumn bring another moderately brainy studio sci-fi movie? Assuming there is a next autumn: probably. Those who didn’t get caught in Arrival’s tractor beam opted instead for fantasies involving a magical organization that protects all of us from ill-tempered megalomaniacs and trolls that sing and dance to Justin Timberlake songs instead of harassing female celebrities. In other words, it was a repeat of last weekend’s box-office results, with Doctor Strange and Trolls holding onto the top two positions. The former, which added another $43 million to Marvel’s overstuffed coffers, made this officially the highest grossing year for Disney ever, both domestically and internationally—and that’s with Moana and Rogue One still on the way. At least someone’s having a good 2016. As far as the other new releases go, Almost Christmas opened to a solid $15.5 million in fourth place, edging past Hacksaw Ridge, while EuropaCorp’s Shut-In made a quiet $3.7 million—about as much as it could probably expect to make, given the very limited marketing campaign and the zero percent it’s rocking on Rotten Tomatoes. Meanwhile, Billy Lynn’s Long Halftime Walk strode into just two theaters, starting its theatrical run with $120,000, while Paul Verhoeven’s diabolical Elle made about half as much on the same number of screens. Finally, some much needed good news: Moonlight continues to expand into more theaters, approaching $5 million on the strength of its unanimous praise. Its empathy and sensitivity is what we need right now, even if it currently looks about as alien as the visitors from Arrival.